Boeing B 75 Stearman "N43GK"
Boeing B 75 Stearman is one of the most famous American biplanes. (Designed and first constructed in 1933 was a prototype model 70 in a Stearman Aircraft Company, Wichita within just 65 days. The factory was located in Wichita and whole process took just 65 days) The original owner of the company - Lloyd Stearman sold the company to Boeing Company, Seattle, just before the beginning of the WWII. The new owner chose for this trainer biplane a mark - Boeing model 75. US Army and US Navy as well as allied Armies used Boeing Stearman for elementary pilot training. The original version of the aircraft was fitted with Lycoming R – 680 engines with 225 HP. However there was a shortage of these engines during WWII and therefore they were replaced by Continental R–670 with 220 HP known by its military mark PT-17 and Jacobs R–775 with 225 HP engines marked PT–18. The Navy's designation of these aircraft was N2S-1 to N2S-5 according to a version of the engine. In 1941 the government started to use popular names for aircraft instead of type designation as this was more understandable for public when referring to military aircraft. Stearman got a designation “Kaydet” at that time. Stearman with registration N43GK s/n 75-8530 was built for US Navy in 1943 as N2-S5. It was mostly used for elementary pilot training at Corpus Christi Navy base, Texas. The government of the USA sold this aircraft to a private owner in 1948 for 500 USD and since then it flew under a civil registration N1330M. Because of its excellent flight characteristics and maneuverability it was rebuilt into a crop duster version in 1952 as this was the fate of most operated aircraft of this type after WWII. A conversion back to a two-seater was done in 1969. The registration N1330M was changed for short time to N785L in 1985. The complete restoration was done in 1987 and aimed for the most possible authentic look and fitting with equipment corresponding to the Navy standard version N2S-5 of 1943. The aircraft livery in all yellow paint is very rare and corresponds to the standards of US Navy trainers in 1944 (most of the 1944 Stearmans were in all silver livery). The new owner requested to re-register this aircraft in 1987 and it was assigned a registration N43GK. We decided to keep this registration for flying in the Czech Republic. 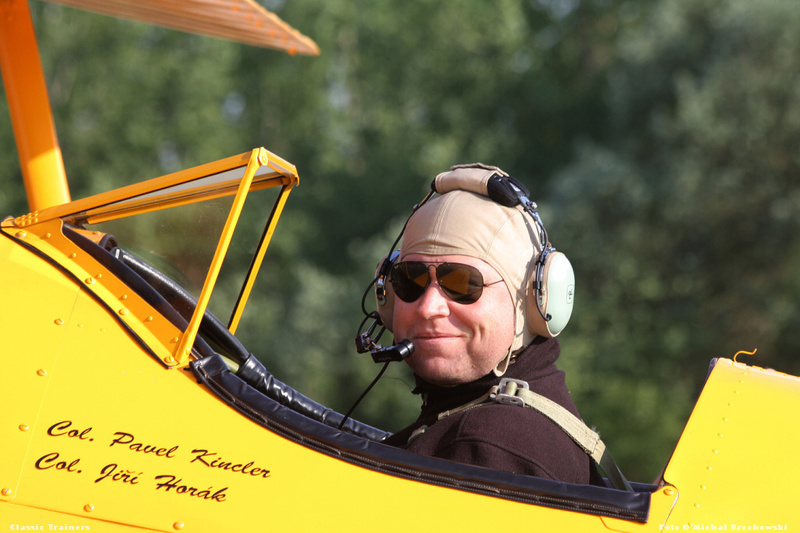 Jiri is an enthusiastic pilot who has been immersed in aviation from a very young age. Jiri got involved with aircraft engineering when he was 15, and learnt to fly on gliders the same year. He is still active glider pilot with many 500km cross-country flights. Jiri owns a Cirrus 75 glider with his wife Olga. She is a glider instructor and holds a PPL. He started to fly historic aircraft during his basic training back in early 90-ties in aeroclub – he was trained on 1953 Zlin 126. Since this time he loves everything with tail wheel. He is a display pilot flying his Stearman and from 2013 season the AT-6 Harvard Mk.II also acts as Pilatus P-2 ferry pilot. Jiri is interested in warbirds maintenance and management. He is a founder of Classic Trainers, organization which plays a significant role in Czech warbird scene. He is now an A 320 captain with a British based airline. Jiri has more than 11.000 hours from which 1600 are on 35 different mostly single engine aircraft and gliders. He loves an aerobatic flying with Zlins and Harvard. Radim was born in 1977. He started as a glider pilot at the beginning of 90's. After a short spell as a pure glider pilot he gained his PPL on Zlin 126 and remained a big fan of tailwheel Zlins till today. He flew competition aerobatics up to the Advanced category with the Zlin 50 for almost nine years winning the national championship in Intermediate category three times. Starting with aerobatic displays on the Zlin 526 then later on he stepped up to display Harvard and Pilatus P2-05. Radim has logged 8500hrs in 41 types of aircraft and works as an B737 captain.